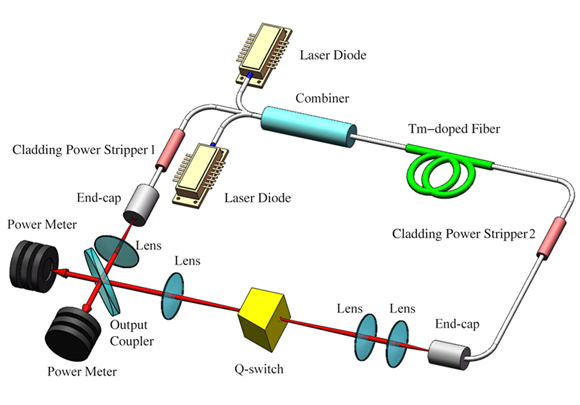 Schematic diagram of actively Q-switched ring Tm-doped fiber laser (TDFL) setup based on free space structure. A type of free space acousto-optic modulator was employed to generate pulsed laser stably in 2 μm region. The maximum pulse energy output of ring TDFL thus built was 150 μJ at a repetition rate of 100 Hz with a pulse width of 382 ns (cavity optical length: 12 m). Measurement accuracy is one of the most important indexes to estimate the capability of LIDAR systems. For Doppler LIDAR, the emission source with a proper long pulse width is beneficial to measurement accuracy. The pulse width is mainly controlled by slave-laser for emission source of LIDAR system using injection-locking technology. With the advantage of unidirectional operation and long pulse output, pulsed fiber ring laser can be used as an ideal slave laser for injection locking laser. At present, the reports of pulsed fiber ring laser operating in 2 μm region mainly focus on passively Q-switched lasers, which have simple structures. However, the poor control over characteristics of output pulses make passively Q-switched laser unfit for injection-locking technology. To sidestep drawbacks of the passive mode, the research group led by Prof. Youlun Ju at School of Astronautics, Harbin Institute of Technology, used one type of free space acousto-optic modulator (AOM) to build an actively Q-switched ring Tm-doped fiber laser (TDFL), which was able to operate in 2 μm region stably. This work was published in Chinese Optics Letters, Volume 14, No. 9, 2016 (W. Liu, et al., Actively Q-switched ring Tm-doped fiber laser with free space structure). In contrast to passively Q-switch technology, actively Q-switched fiber ring lasers can provide more control over the characteristics of output pulses, such as repetition rate and pulse width. AOM is a conventional choice for actively Q-switching. Presently, there are two types of AOMs: fiber coupled and free space. Compared with fiber coupled AOM, the higher damage threshold of AOM with a free space structure makes it more suitable for further research on high pulse energy output of TDFL in the 2 μm region. The maximum pulse energy output of ring TDFL thus built was 150 μJ at a repetition rate of 100 Hz with a pulse width of 207 ns (cavity optical length: 6.68 m). With the same output energy, a pulse width of 382 ns has been achieved by increasing the cavity optical length of the ring TDFL to 12 m.
"The present work was the first step to resolving the problem of narrow pulse width output bottleneck of slave-laser for injection locking laser in the 2 μm region," said Prof. Youlun Ju. Further work will be focused on optimizing the parameters of ring TDFL in the hope that this platform can be put into use for the Doppler LIDAR sensing system.